Don't belittle a beetle - here's what you need to know for beetle control in Melbourne! For most of us, the only beetle we are aware of is the sweetly named, ladybug. We club most others under the term 'insects' while we confuse the others to be some kind of cockroach. But hold up! They can actually cause you harm. That's right, these little things can actually wreck havoc in your home. Food, fabric, furnishings, and wood all stand the threat of getting damaged by them. To add to it, they reproduce at a rapid rate, which is why beetle control demands the technology and expertise that we at Protech Pest Control, give you. Like most other insects, they have some defining characteristics that help you identify them! With the colour and size of beetles, these creatures often get mistaken to be cockroaches or an exotic bugs. So here's a tip on what to look out for. The key to identifying them is by their wings. Unlike other insects, they are blessed to have 2 pairs of wings. One pair is located in front, also known as the elytra. These wings are durable, waterproof, cover the second pair of wings and serve the purpose of protecting them. The second pair of wings located at the rear, are the ones used for flying. Now that's not all! Here's another fact to keep in mind - they differ in shape size and colour, ranging from round to slender to even resembling spiders! Their legs are normally adapted for walking and running, with the larger legs located in front and the small ones located behind. Beetles tend to live in the soil, leaf litter, animal carcasses, nests of other animals, foodstuffs, tree barks, mucky areas etc. Basically, they love the feel of nature. Now although they live close to nature they tend to move towards houses on the onset of winter and lights in particular. At this time of the year they tend to populate areas like carpets, sofas etc. Once again their preferences vary according to the species but they tend to stick close to food sources. 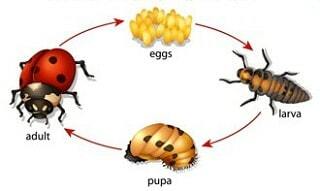 Like other insects beetles too go through the same stages - egg, larva, pupa, adult. It's important to remember that unlike bugs they complete their metamorphosis cycle. However the time against which different species complete the cycle differs. Some may take months while some take years depending on the availability of food and the environmental conditions. The larvae are commonly referred to as grubs and differ in shapes and sizes. Now here's why you need to know about the sizes, shapes, and tenure of these eggs. The adults lay the eggs close to food so that once the lava emerge they can feed and become pupas. The maggots can either have segmented legs or none at all. The legless grubs have distinguished mouth parts which help them feed with ease and resemble those of fly maggots. With this information in place you should be able to identify these clumps anywhere near a food source to verify your doubt of it being a beetle infestation. 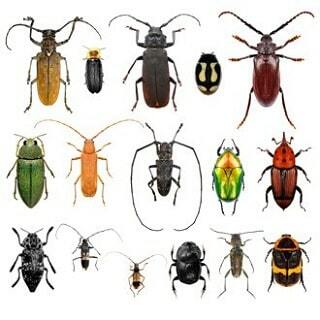 How many Types of Beetles are there? 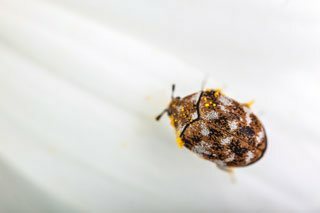 Bed Bug or Beetle, how can I tell the difference? 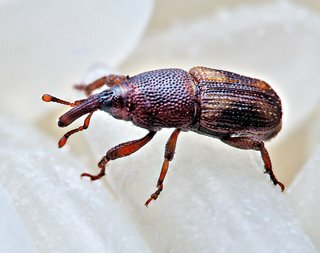 Diet - bugs have a liquid diet while beetles actually eat and feed on things. Wings - Beetles have 4 wings, two of which are used for flying and are hidden under the elytra. They may or may not have wings, if they do so the wings are membrane like and thickened at particular parts. But how are they getting inside the house in the first place? Long story short, here are the entry points you need to be keeping a watch on - doors, windows, wall cavities, fresh-cut flowers and plants, greenery along the landscape of the house. Their bites can endanger an unborn child and cause pregnancy complications. Older people may not be as healthy as younger people to fight off an allergic reaction caused by a beetle bite, causing them far more harm. Children can develop big blisters after getting bitten. The worst part is the child could have walked right into a beetle infestation and you wouldn't know until it's too late to identify what has caused them such pain. In certain cases it may not even be known whether the child is allergic to their bites, resulting in health complications. We 'Protech' you from beetles! As in the case of any other pest, we believe in getting to know our enemy so we can tackle him effectively. After a thorough inspection of your home we identify the type of species creating havoc, the areas it has permeated, the cause of the same, and the treatment that will work against that particular species. Oh but wait we don't just rush through the treatment. We loop you in so that you are clued in with our treatment methods and trust us to the fullest. For the ones that cannot be removed by vacuuming, good sanitation practices or cutting out their food and light source we make use of chemical treatments and insect growth regulators. This way we get them out of your home in a way that doesn't affect you, your family and your pet's health. Finally, you can always bank on the latest technology we make use of to perfect the job. The insect growth regulator helps us rid your home of these little pests that are still in the larva or pupa stage, so that the infestation does not return. To sum things up - Call us today for a beetle-free home! Find out if they offer same day pest control service (normally)? 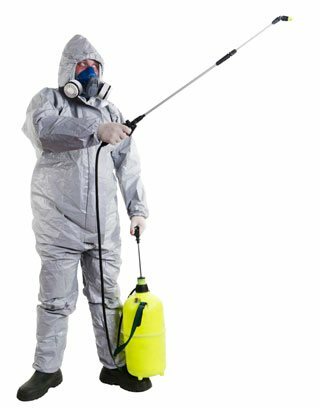 Is their experience in the Pest Control field over 2 decades? Are they fully accredited and licensed to carry out pest & beetle control services from the Victorian government? Is their beetle removal technology up-to-date and environment-friendly? Do they have a specialist division for inspections, reports and treatments? Finally, do they guarantee getting rid of the beetles and ensuring they do not return?